Noise cancellers are an essential resource for HF radio listening. No longer a last resort as the noise floor becomes worse and worse. Unless you live in a quiet rural location – and sometimes even then – radio frequency interference makes HF listening a challenge. These devices should actually be called “interference cancellers”. You use them to remove or reduce a whole range of signals from unintended emitters – power lines, power supplies, home appliances, motorized tools and consumer electronics. Noise cancellers work on a deceptively simple principle. If you shift the phase of a signal by 180° then you can use the resulting wave to cancel the original signal. These devices receive the interference on a separate antenna, reverse its phase and then mix it together with the original combination of desired signal and noise. If you get the phasing and amplitudes right, the result is almost magic. There is so much RFI these days that I can’t imagine not using one of these devices. There is only one trick to success: setting up a proper (separate) noise antenna. More on that in the next article in the series. 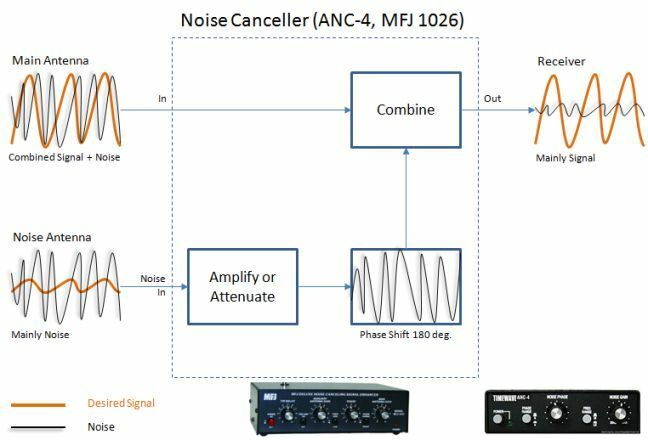 Two popular noise cancellers are the Timewave ANC-4 and the MFJ-1026. Both cost around US$200 and offer similar performance. Both also contain automatic transmit/receiver switching. With either, you simply make adjustments to the phase and strength of the noise signal to achieve interference reduction. The MFJ unit also includes an antenna preamplifier. This is not really necessary for most modern receivers. It also adds a third adjustment (main antenna gain) and results in slightly more complicated tuning procedures. The Timewave unit has been around longer and has sturdier construction. Other than the preamplifier, the other difference lies in the type of combiner used. The MFJ uses an active FET mixer for combining reversed noise and signal, while the Timewave relies on a passive hybrid combiner. At the extreme, the Timewave should be less prone to overload or IMD. Finally, both devices come with a built-in whip antenna for local (in-shack or in-house) noise. This whip is useless for neighborhood interference, unless from adjacent apartments. You really want to use an external noise antenna, and use other methods to eliminate RFI inside your house, where you have some control.